1997 Mazak FH480X 4-Axis 2-Pallet CNC Horizontal Machining Center s/n 131366 w/ Mazak Mazatrol M-PLUS Controls, 90-Station ATC, CAT-40 Taper Spindle, 4 th Axis Thru Pallets, (2) 16” x 16” Pallets with 12” x12” x 21” Tombstones, Dual Chip Augers, Chip Conveyor, High Flow Coolant. 1992 Fadal VMC6030HT mdl. 907-1 CNC Vertical Machining Center s/n 9203059 w/ Fadal CNC88 Controls, 21-Station ATC, CAT-40 Taper Spindle, 7500 RPM, Hand Wheel, 30” x 62” Table, Coolant. 1998 Fadal VMC4020HT mdl. 906-1 CNC Vertical Machining Center s/n 9803748 w/ Fadal CNC88HS Controls, 21-Station ATC, CAT-40 Taper Spindle, 7500 RPM, 4 Meg Expanded Memory, Rigid Tapping, Graphics, Tool Load Comp, Servo Coolant, Hand Wheel, 20” x 48” Table, Coolant. 1990 Fadal VMC4020HT mdl. 906-1 4-Axis CNC Vertical Machining Center s/n 9001929 w/ Fadal CNC88 Controls, 21-Station ATC, CAT-40 Taper Spindle, 7500 RPM, 20” x 48” Table, Coolant. 1990 Fadal VMC40 mdl. 904-1 4-Axis CNC Vertical Machining Center s/n 9001028 w/ Fadal CNC88 Controls, 21-Station ATC, CAT-40 Taper Spindle, 7500 RPM, 16” x 36” Table, Coolant. Mazak “Power Center V-15” CNC Vertical Machining Center s/n 41840 w/ Fanuc System 7T Controls, 20-Station ATC, CAT-50 Taper Spindle, 36 ½” x 94 ½” Table, Coolant. Acroloc M-15 CNC Vertical Machining Center w/ Fanuc / GN 6 Series Controls, 15-Station Tool Carrousel, 14” x 38” Table, Coolant. Acroloc mdl. V 4-Axis CNC Vertical Machining Center w/ Fanuc / GN 6 Series Controls, 12-Station Tool Carrousel, 4 th Axis 10” 3-Jaw Rotary Head, 14” x 38” Table, Coolant. Acroloc mdl. V CNC Vertical Machining Center w/ GN 3000-C Controls, 12-Station Tool Carrousel, 14” x 38” Table, Coolant. (2) 1995 Kia Kiaturn 15 CNC Turning Centers s/n’s KIA15389, KIA15388 w/ Fanuc 0T Controls, Tool Presetters, 12-Station Turrets, Tailstocks, 6 ½” 3-Jaw Power Chucks, Coolant. 1996 Kia KIT30B CNC Cross Slide Lathe s/n KIT30112 w/ Fanuc Series 0-Mate TK Controls, 5000 RPM, 6 ½” 3-Jaw Power Chuck, 8” x 19 ½” Cross Slide Table, Coolant. Mazak “Slant Turn 30” Universal 1500 CNC Turning Center s/n 42630 w/ Fanuc System 6T Controls, 12- Station Turret, Tailstock, 12” 3-Jaw Power Chuck, Chip Conveyor, Coolant. Mazak “Slant Turn 15” 4-Axis Twin Turret CNC Turning Center s/n 42595 w/ Fanuc System 7T Controls, 8- Station Upper and Lower Turrets, 8” 3-Jaw Power Chuck, Chip Conveyor, Coolant. (2) Miyano Miyanomatic CNC-7BC CNC Turning Centers s/n’s SK0116BC, SK0110BC w/ Fanuc System 5T Controls, 12-Station Turrets, Tailstocks, 10” 3-Jaw Power Chuck, S20 Collet Pad Nose, Chip Conveyor, Coolant. Fanuc System 6T Controls, 6” 3-Jaw Chucks, 5C Collet Noses, 6” x 22” Cross Slide Tables, Coolant. Conomatic Size 3 ½” 6-Turret Automatic Screw Machine s/n 3301SF w/ 6-Drill Stations, 4-Cross Slides,Bar Stop, Coolant. (2) Acme Gridley 2 5/8” mdl. PA-6 6-Turret Automatic Screw Machines s/n’s 84607, 84447 w/ 6-Drill Stations, 5-Cross Slides, Bar Stops, Chip Conveyors, Coolant. (2) New Britain mdl. 52 6-Turret Automatic Screw Machines s/n’s 39538, 39361 w/ New Britain Controls, 6-Drill Stations, 6-Cross Slides, Chip Conveyors, Coolant. (4) New Britain – Gridley mdl. 40-60- 41-61- 42-60 6-Turret Automatic Screw Machines w/ 6-Drill Stations, 6-Cross Slides, Bar Stop, Chip Conveyor, Coolant. (14) Davenport mdl. B 6-Turret Automatic Screw Machines w/ Drilling Stations, 5-Cross Slides, (7) Threading Attachments, Noise-Tamer Sound Enclosures, Rotamist Misc Collectors, Chip Augers, Bar Feeds, Coolant. (4) Davenport mdl. B 6-Turret Automatic Screw Machines w/ Drilling Stations, 5-Cross Slides, Chip Augers, Coolant. (2) Brown &amp; Sharpe No. 2 1 ½” Cap 6-Turret Automatic Screw Machines s/n’s 542-2- 5179, 542-2- 2671 w/ 6-Drill Stations, 4-Cross Slides, Coolant. Brown &Sharpe No. 0 6-Turret Automatic Screw Machine s/n 1012 w/ 6-Drill Stations, 3-Cross Slides, Coolant. (2) Brown &amp; Sharpe No. 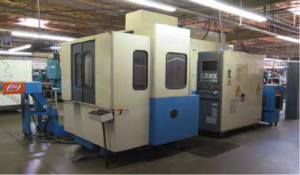 00 ½” Cap 6-Turret Automatic Screw Machines s/n’s 542-00- 7785, 542-00- 4122 w/ 6-Drill Stations, 3-Cross Slides, Coolant. MEChanicy FWA41 Universal Power Mill s/n 95/11 w/ 28-1300 RPM, Power Feeds, 50-Taper Horizontal and Vertical Spindles, Universal Vertical Milling Head, Box Ways, 15 ¾” x 78 ¾” Table. Bridgeport Series 2 – 2Hp Vertical Mill s/n 4432S w/ 2Hp Motor, 40-4200 Dial RPM, Chrome Box Ways, Power Feed, 11” x 58” Table. Bridgeport Series I – 2Hp Vertical Mill s/n 208777 w/ 60-4200 Dial RPM, Chrome Ways, Power Feed, 7” Riser, 9” x 42” Table. Bridgeport Vertical Mill s/n 149234 w/ 1.5Hp Motor, 60-4200 Dial RPM, Power Feed, 9” x 42” Table. Kondia PowerMill mdl. FV-1 Vertical Mill s/n 779 w/ Pathfinder-5 DRO, 60-4000 Dial RPM, Power Feed, 9” x 42” Table. Webb / Champ mdl. 2VH Vertical Mill s/n 2559 w/ 3Hp Motor, 60-4200 Dial RPM, 10” x 50” Table. Kent-Owens No. 1-14 Automatic Horizontal Mill s/n 1-14- 1233 w/ 75-1000 RPM, 40-Taper Spindle, Arbor Support and Arbor, 9” x 32” Table. (2) Baker mdl. AM Automatic Pneumatic Horizontal Mills s/n’s 891, 618 w/ 3-Speeds, 6 ¼” x 20” Table. Okuma Type LS 18” x 52” Geared Head Lathe s/n 9635 w/ 35-1800 RPM, Taper Attachment, Inch/mm Threading, Tailstock, Steady Rest, Trava-Dial, KDK Tool Post, 12” 3-Jaw Chuck, Coolant. Victor mdl. 1640B 16” x 40” Geared Head Gap Bed Lathe s/n 79010221 w/ 33-2000 RPM, Inch/mm Threading, Tailstock, Steady Rest, 5C Collet Closer, 8” 3-Jaw Chuck, 10” 4-Jaw Chuck, Coolant. Victor mdl. 1630 16” x 30” Geared Head Gap Bed Lathe s/n 55306 w/ 65-1800 RPM, Inch/mm Threading, Tailstock, 5C Collet Closer, Tool Post, 8” 3-Jaw Chuck. Hardinge Second OP Lathe w/ 6-Station Turret, 5C Collet Closer. Logan mdl. 2555VH Lathe s/n 84117 w/ 55-2000 RPM, 6-Station Turret, Cross Slide, 5C Collet Closer. Cincinnati mdl. OM Centerless Grinder s/n 2M2H5KNZ w/ Hydraulic Wheel Dressers, Coolant. Cincinnati Tool and Cutter Grinder w/ Motorized 5C Work Head. Boyar Schultz 612 6” x 12” Surface Grinder s/n 10339 w/ Electromagnetic Chuck. (2) Harig 6” x 12” Surface Grinders. Black Diamond Precision Drill Sharpener. Pedestal Grinders and Belt Sanders. U.S. Machine Tool mdl. 1 Horizontal Cam Cutting Machine s/n 4489R w/ Cam Attachment, 6 ¾” x 23”Table. Leon Barrett mdl. 20 Chip Spinner. (3) Yuasa “Accu-Tap II” mdl. ATV-16 and ATV-008 Automatic Tapping Machines. Rockwell 4-Head, 3-Head and 2-Head Gang Drill Presses. DoAll mdl. 2013-V 20” Vertical Band Saw s/n 439-84576 w/ 55-5200 Variable RPM, 26” x 26” Miter Table, Fence System. 12” Hydraulic Horizontal Band Saw w/ Manual Clamping, Coolant. (2) Pneumatic Abrasive Cutoff Saws. Custom Long Stroke Hydraulic H-Frame Press w/ 18” Stroke. Trinco mdl. 36/BP Dry Blast Cabinet. Lincoln Idealarc 250 Stick Welder. Ingersoll Rand mdl. SSR-EPE50 50Hp Rotary Air Compressor s/n F16950U96304 w/ Intellisys Controls, 204 CFM @ 125 PSIG. Ingersoll Rand mdl. SSR-EP50SE 50Hp Rotary Air Compressor s/n G5538U97016 w/ Intellisys Controls, 194 CFM @ 125 PSIG. Ingersoll Rand mdl. TM200 Refrigerated Air Dryer s/n 96ETM197. Fadal VH65 4 th Axis 6 ½” Rotary Head w/ 6” 3-Jaw Chuck s/n 1951190. Huot “Super Scoot” 40-Taper Tooling Cart. Troyke 12” x 12” Rotary Cross Slide Table. (2) 8” 3-Jaw Indexing Chucks. Bendix Cordax 1000 CMM Machine s/n 2-3687-0881 w/ Bendix Measurement Processor DRO, Renishaw PH-1 Probe Head, Upgraded Software, 19” x 30” Table. OPG mdl. OQ-20 20” Floor Model Optical Comparator w/ Di-Metric DRO, Surface and Profile Illumination, 6 ½” x 27” Motorized Table. J &amp; L 14” Floor Model Optical Comparator s/n E-37972. Pratt &amp; Whitney mdl. C Super-Micrometer w/DRO. (3) Mitutoyo 18”and 12” Dial Height Gages. Sheffield mdl. 542 Flatness Gage. Mitutoyo and Starrett OD Mics to 16”. Mitutoyo Blade Mics to 8”. Mitutoyo and Fowler Dial Bore Gages to 6”. 8” x 16” Bench Center. Standridge, 36” x 60” x 6 ½” 2-Ledge Granite Surface Plate w/ Stand. Copper, Brass, C360, Bronze, Si-Bronze, AL-Bronze, 2011, 2024, 6061,7050, 7075, Inconel, Vascomax, A2, A286, D2, H13, 303, 303SEL, 304L, 430F, 17-4, 1018, 1137, 4130, 8620, 12L14. Toyota 7FCGU35 7250 Lb Cap LPG Forklift s/n 61147 w/ 3-Stage Mast, 187” Lift Height, Side Shift, Solid Tires. Clark C30 3000 Lb Cap LPG Forklift s/n 328-QK-248 w/ 2-Stage Mast, 130” Lift Height, Solid Tires. Portable A-Frame Gantry w/ ½” Ton Electric Hoist. Western Scale Co. 5000 Lb Cap 4’ x 4’ Platform Scale.